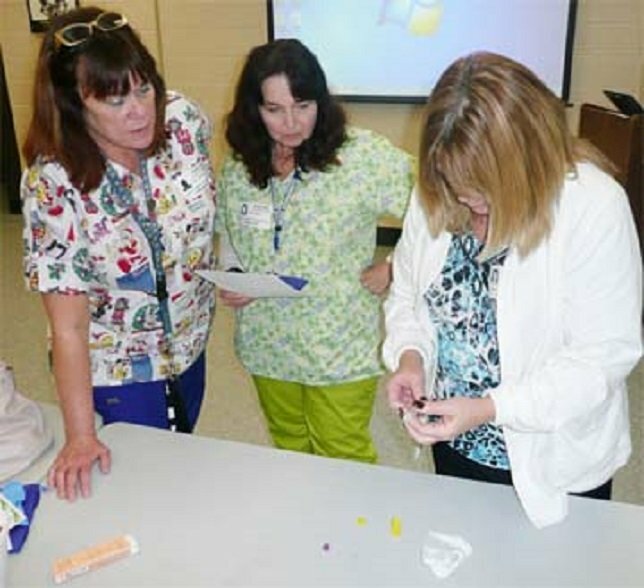 Nurses assemble a naloxone syringe. New York, NY - January 19, 2016 - Attorney General Eric T. Schneiderman today announced an agreement with Amphastar Pharmaceuticals, Inc. to extend a price cut for naloxone, a highly effective antidote that can quickly reverse an opioid overdose, for all agencies in New York State for the next year. The contract stipulates that Amphastar will cover a $6 rebate per dose, which will also automatically increase, dollar-for-dollar, to match future growth in the wholesale price. As part of the agreement, this rebate is available not only to the Office of the Attorney General, but also all public entities, including but not limited to the State Department of Health, the City of New York, the governments of individual New York Counties, and the drug treatment centers and harm reduction programs they fund. When concerns were raised about the affordability of naloxone for agencies across New York, Attorney General Schneiderman last year successfully negotiated the one year price reduction. Today’s agreement extends the same agreement for a one year period. Overall, the deal reduces the price of naloxone by nearly 20 percent. The rebate applies even if the purchasing agency separately negotiated a discount below the published wholesale rate, and regardless of whether the agency buys from Amphastar or a third party. Last year’s agreement served as a national model that was adopted by other states, including Delaware, Ohio, and Rhode Island. The abuse of heroin and prescription drugs is a growing problem throughout New York and the United States. In 2013, more than half of New York City’s 782 drug-related overdoses were from heroin. The same year, there were almost 20,000 hospitalizations – mostly emergency visits – related to heroin in New York State. Nationwide, fatal overdoses from heroin doubled from 2010-2012, according to Centers for Disease Control and Prevention (CDC). The U.S. Drug Enforcement Administration estimates that these numbers are still on the rise. In addition to the price reduction for Naloxone negotiated by Attorney General Schneiderman, the Attorney General’s Office launched in 2014 the Community Overdose Prevention (COP) program, which was supported by $5 million of joint federal-state criminal and civil forfeiture money and provided funding to equip every state and local law enforcement officer in the state of New York with naloxone. Police departments and other appropriate agencies were able to submit receipts to the Attorney General’s Office for full reimbursements of Naloxone purchases and related training costs. Numerous law enforcement agencies across New York have reported using Naloxone kits to save the lives of individuals experiencing an overdose. The Attorney General’s office has adopted a comprehensive approach toward reducing heroin and prescription drug abuse in New York State. To date, investigators have broken up 25 of the largest drug and gun trafficking gangs in the state. I-STOP, the nation’s first real-time prescription tracking system for the most addictive prescription drugs, has also resulted in reduced doctor shopping across New York. Subject: LongIsland.com - Your Name sent you Article details of "A.G. Schneiderman Announces Extension Of Agreement To Cut And Cap Price Of Heroin Overdose Antidote Across New York State"